Dr Ken Fox is delighted to be going back to his hometown to speak at the Allingham Arts Festival in Ballyshannon, Co. Donegal, Republic of Ireland, on Saturday 5 November 2016 in the Abbey Arts Centre where he spent many, many nights attending the cinema during the 1970s. “It’s like going back to the source” says Ken. 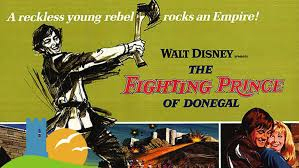 Ken is givin g a talk on The Fighting Prince of Donegal (O’Herlihy, 1966) following the free screening of the film at 10.30-12.20 — his talk is at 12.45-1.45. Ken is really looking forward to seeing old friends and hopefully some members of the audience who, like him, saw the film when it first came out in 1966. The Festival is a wonderful four days of events, talks, workshops, lectures, screenings with the highlight of hearing the brilliant Irish novelist Anne Enright speak about her writing. Dr Ken Fox is Principal Lecturer in the School of Media, Art and Design. Ken teaches modules on American Cinema in the Film, Radio and Television Programme and in the American Studies Programme. In Year 2 he teaches a module on American Independent Cinema introducing students to a range of films that reflect the relationship between mainstream and independent films. His Year 3 Cinematic City module; in particular, reflects his current research interests, as Ken’s PhD focused on Cinematic Visions of Los Angeles. Ken has been a Fellow of the Higher Education Academy since 2007. His chapter, “In praise of the inauthentic: the cinematic landscape of The Fighting Prince of Donegal” appeared in Graeme Harper and Jonathan Rayner’s Film Landscapes: Cinema, Environment and Visual Culture (Cambridge Scholars Press, 2013). In the latest of our research seminars, Anthony Faramelli (Kingston University/University of Brighton) will look at communion and new subjectivities in social media. This paper will be a revitalisation of Bataille’s theories of community by looking at the spaces of communion that digital telecommunication has opened up. Thinking through Deleuze and Guattari’s work on the “virtual,” the paper will argue that digital telecommunication has opened an ever expansive space where subjects are brought in a form of communion with the potential to facilitate the formation of new subjectivities that radically break away from philosophy’s traditional understandings of community. This paper will begin by briefly sketching out how schizoanalysis (the philosophic system developed by Gilles Deleuze and Félix Guattari) understands the formation of subjectivity and then briefly stitch together a schizoanalytic understanding digital telecommunication from the fragments of Deleuze and Guattari’s later work. The paper will also look at points of resistance found within political online communities. By juxtaposing Deleuze’s interest in political Third Cinema and his concept of the time-image with Bataille’s work on communion and sacrifice and examine how manifestations of political action are transmitted between globally diffuse activists, engendering new forms of resistant subjectivities. Anthony Faramelli lectures in political philosophy, media theory, culture studies, psychoanalysis and postcolonial theory at Kingston University and at the University of Brighton. His research and publications are concerned with modern European philosophy, practices of resistance in postcolonial politics and social-therapy, specifically the practice of schizoanalysis. He is the editor with Rob White and David Hancock of the forthcoming collection, Critical Spaces: Crisis and Critique for Bloomsbury Philosophy. Future projects include an examination of the impact of the radical psychotherapists active in the French Resistance had in postcolonial politics. In 2013, Dr Feelgood founder, Blockheads member, Game of Thrones actor and musical legend Wilko Johnson was diagnosed with terminal cancer. With ten months to live he decided to accept his imminent death and went on the road. His philosophical response made him even more beloved and admired. And amazingly he didn’t die. This evening he discusses his life in music, his life with cancer and his life now in conversation with Shane Blackman, Professor of Cultural Studies at Canterbury Christ Church University. Before starting his career in sociology and cultural studies, Shane Blackman worked in the music industry as a manager of an Our Price Records store in Oxford Street, London. He teaches pop music and youth cultures, as well as researching sociological and ethnographic aspects of young people’s culture. Tim Jones will be presenting the world premiere of his documentary about Peter Watkins, director of The War Game and Punishment Park.